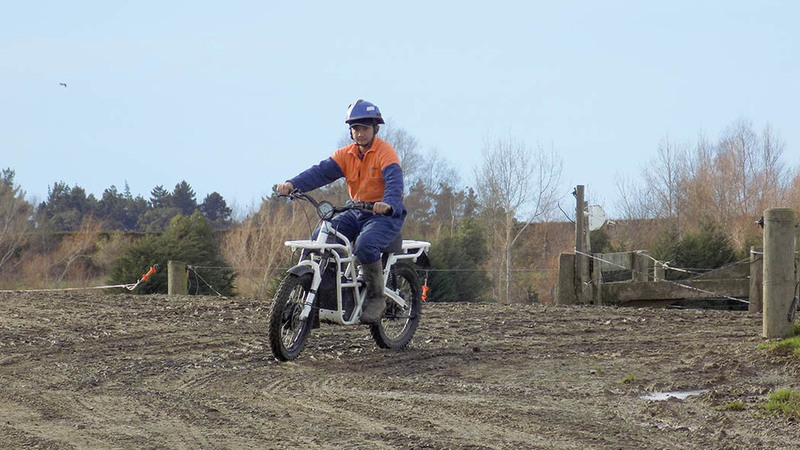 On his New Zealand travels earlier in the year, James Rickard got the chance to try out an electric powered bike specifically designed for agricultural work. The Ubco is a serious off-road workhorse. Those of you with a keen eye at this year’s Lamma machinery show may have spotted a curious contraption from a little known Kiwi company, Ubco. Specialising in electric powered bikes, its alternative to petrol is claimed to offer several benefits including lower running costs, simpler operation and virtually no noise. Conceived by electric bike experts Daryl Neal and Anthony Clyde, the bike first got its public outing at the 2014 New Zealand Fieldays Event. Catching the eye of one of the event’s innovation competition judges, Tim Allan, founder of product development company Locus Research and now Ubco’s CEO, the seed was sown for him and the two inventors to take the product further. Following further development of the bike, the Ubco, meaning utility bike company, brand was formed in 2015, with full production commencing in December the same year. With more than 300 bikes sold since then, the product is now well established in its domestic market, as well as in Australia and the US. The firm is based in Tauranga on New Zealand’s North Island, with the bikes built in China. As well as agriculture, Mr Allan sees the bike suitable for many rural business, including tourism, conservation, horticulture, hunting, land management, and search and rescue. Now aiming for a foothold in the UK and Ireland, Ubco’s latest incarnation was recently revealed at September’s Irish Ploughing Championships. This latest version is ECE approved, road homologated, and has a range of 120km. “I think people are really starting to look at alternatives now, particularly those who are producing their own power,” says Mr Allan. To see how the bike performs, we caught up with a 2016 version for a blast through the dramatic surroundings of New Zealand’s South Island, just outside Queenstown. With its rugged exoskeleton frame and trial bike tyres, the Ubco is more akin to a motor bike – it is not just a pedal bike with electric motors. Similarly, it is not simply a motorbike which had its engine swapped for an electric motor. There are no drive shafts or chains. Instead, power is sent directly to individual wheel motors, one on the front and one on the rear. This affords two-wheel drive, offering greater traction for the wet patches and greater hill climbing ability. Front and rear electric wheel motors afford two-wheel drive, improving the bike's ability to negotiate wet spots. While our bike featured 2kW of wheel motors the latest bikes now total 2.64kW. This may not sound much in terms of power, but the constant torque means throttle response is swift. There are two power modes to choose from: full power mode offering more aggressive acceleration and a top speed of 45kph, while economy mode gives a gentler throttle response and a limited top speed of 30kph. Granted, it does not have the top speed of a petrol bike, but it is more than fast enough for chasing stock and negotiating rough terrain. Compared to a petrol bike, it is much easier to ride with a lot less input. There are no gears to change, no clutch to modulate and there is not as much weight to move around; just twist the throttle and go. This should make it much easier for less experienced riders to quickly become accustomed to. Power comes from a lithium-ion battery, mounted low down in the bike’s frame. The battery can be charged while in the bike, or it can be lifted out and put on a bench, for example. A full charge takes about six to eight hours to complete. Using the same battery supplier as Tesla does for its cars, the Ubco has a 120km (74 mile) range. “Batteries are the most important element of this bike,” says Mr Allan. “They have to be safe and reliable, which is why we use Panasonic, the same supplier as Tesla. Just in case you over stretch the range, there is also a virtual reserve tank feature which keeps a bit of battery power on standby for a limp home mode. It is also worth remembering the bike does not use any power when there is no throttle applied, unlike a petrol bike. In addition, its near silent running means it is kinder to your ears and stock should be less startled, an attribute perhaps more suited to game keeping. The latest bikes also feature regenerative braking, which converts the kinetic energy of the rolling wheels into electrical energy. This may be offered as a retrofit option on current bikes in the future. The bike is mostly aluminium construction, offering corrosion resistance and a relatively lightweight design. With two beefy racks and 17 threaded brackets dotted around the bike, accessories can easily be attached and configured to suit, such as tool boxes, for example. Maintenance-wise, the main things to keep an eye on are the electric motors’ bearings and planetary gears, which need inspecting regularly, particularly if operated in harsh conditions. Ubco claims the bike's payload, including rider, is about 200kg. Should one of the motors pack up, it is possible to get home using one wheel drive. For 2018, the bikes will be fitted with Bluetooth connectivity, allowing wireless updates of the bikes’ electronics, such as throttle response, torque curves, etc. They also come fitted with an inverter capable of powering a 3,000W appliance. Handy for grinders, drills, small welders, etc. Further down the road, Ubco is evaluating a four-wheel utility vehicle (UTV). The Ubco bike is definitely a credible alternative to a two-wheel petrol bike and will be a tempting option for four-wheel users too, especially if the quad is only being used to chase stock. Unlike many electric bikes which are designed for the road then adapted for work, these are specifically designed for off-road use. And it shows too; this is a proper workhorse. As the company’s name suggests, it is quite a utilitarian riding experience, so do not expect the thrill of a petrol bike. But it does get the job done and it is easy to operate. And if your farm is producing electricity, it should fit in well.